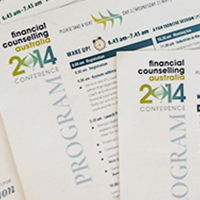 More than 400 financial counsellors from across the country recently attended Financial Counselling Australia’s National Conference in Melbourne. The three day event was an opportunity for financial counselling professionals to discuss the sector’s big issues and network with others from their industry. Key sessions at this year’s conference included a discussion about the new telecommunications hardship framework which includes a new set of policies and principles for dealing with financially stressed clients; a session on new money management tools and their potential benefits for clients; and an Aboriginal and Torres Strait Islander showcase which explored the specific challenges financial counsellors face when advocating for these clients. Pauline Stodden, a Financial Counsellor at Relationships Australia SA, said the event was incredibly well-run and gave her a boost of confidence. “Attending professional development events like this is really important. Being able to learn from other people’s case studies was incredibly valuable, as was having the opportunity to meet and talk with other financial counsellors from across the country,” Pauline said. Fellow Financial Counsellor, Tia Walker, added that the session on hardship was particularly useful. “It was great to see that the financial services sector now has a much better understanding of hardship situations and has implemented policies and principles that will make it easier to negotiate and advocate for our clients,” Tia said. The Conference came as the Federal Government renewed funding for financial counsellors to provide free and independent advice and support to over 220,000 cash-strapped Australians this financial year. Fiona Guthrie, Executive Director of Financial Counselling Australia, said that this renewed assistance will have a positive effect on clients’ financial, physical and mental health, while saving the economy millions. “The numbers are compelling; [as a result of financial counselling] 66 percent of clients have their financial difficulties resolved, 63 percent feel their mental and emotional wellbeing is improved, and 45 percent feel physically healthier,” Ms Guthrie said. If you’re interested in becoming a financial counsellor, consider studying the Diploma of Community Services (Financial Counselling) at the Australian Institute of Social Relations.